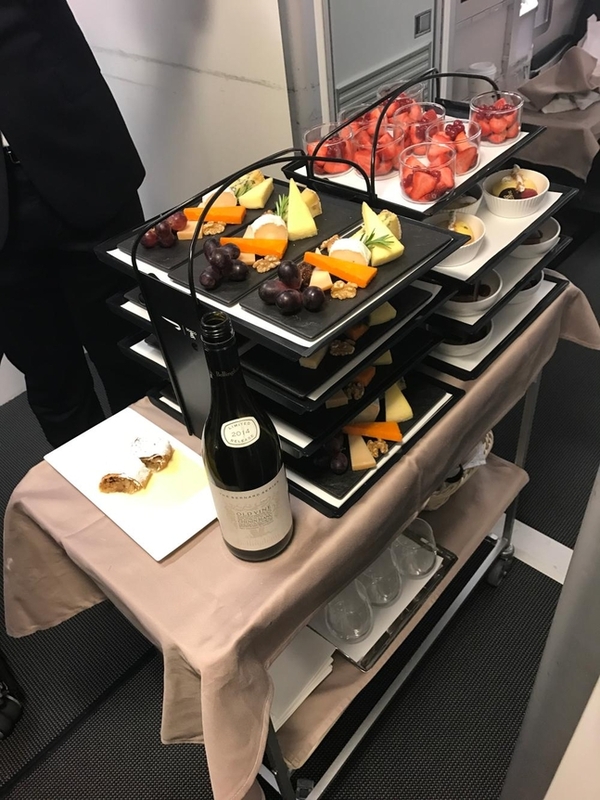 BA launched their new Club World dining and bedding last year with a large investment into the onboard service. Unfortunately, even after a few months, they started to take away some of the initial improvements such as the day pillow and the salt and pepper shakers (one of my personal pet peeves). The new trolleys with their display of starters and desserts looked great but it has led to meal services taking far longer than they used to. This may be fine if you are on a daytime leisure flight, but of you want to work or sleep it is not ideal. Many crews had already started to not use the trolley leaving to huge inconsistencies in the on board service. BA have finally decided to bite the bullet and makes some changes. From 28 October, Club World dining will be delivered by hand rather than from the trolley. This means the trolley, etagere (where the meals were displayed) and wine bowl will be disappearing. It is a bit of a shame having made such a huge song and dance about it that they couldn’t get it to work. However, at the end of the day, I am not that bothered about how they deliver my meal, as long as I don’t have to wait hours. BA still will be serving the new food exactly as before, it just won’t be from a trolley. British Airways are refurbishing the entire customer experience at New York’s JFK area with a new check-in area, First Wing and a refurbishment of the lounges. 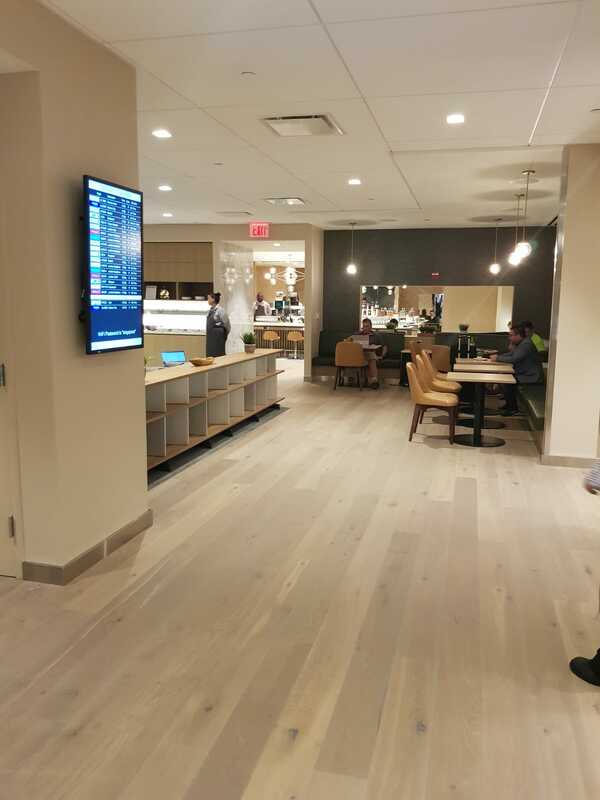 At JFK they have three lounges, Club, First and the Concorde Room. The First lounge has been closed for a while now as the first of the lounges to be spruced up. Whilst not totally finished as the new dining area is not yet open, they have re-opened the main part of the lounge. The lounge has taken some space from the Galleries Club lounge (which is huge) to make the new dining area which is due to open in a couple of months. Reader Alex, Twitter: @alexolivier kindly supplied some photos of his visit this weekend. 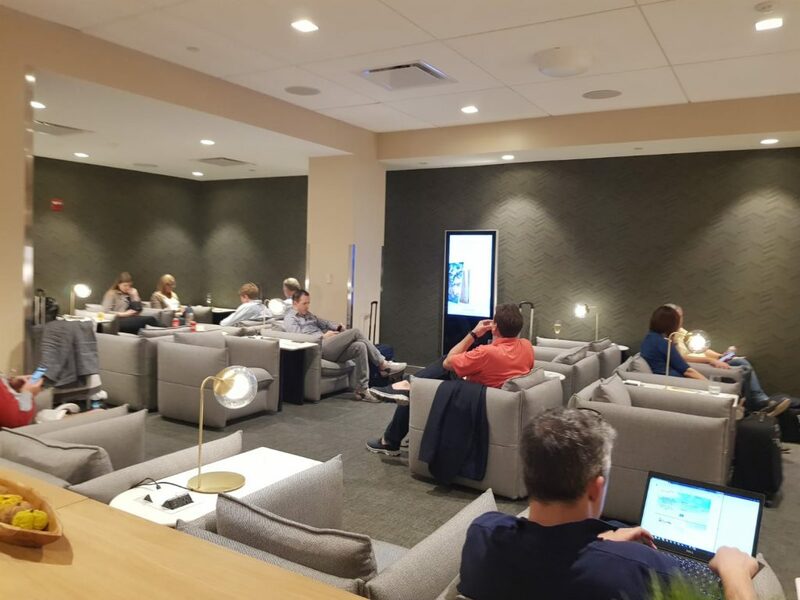 As you can see from the article photo at the start, the lounge is similar to the Rome lounge which I reviewed here. 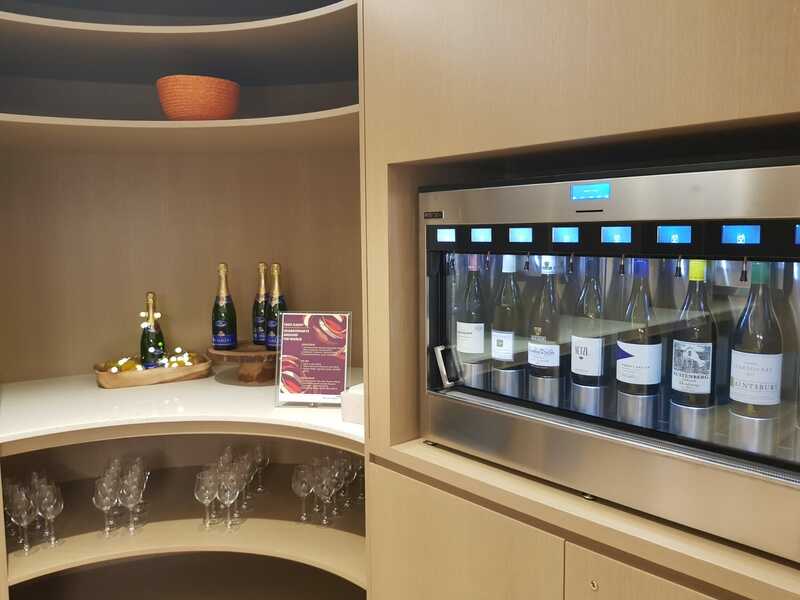 As well as the bar area I like the look of the wine bottle dispensers which help keep open wine preserved perfectly and at the right temperature. It will be interesting to see if staff can keep up the demand to keep the dispensers topped up. The champagne is currently Pommery which is probably one of my least favourite champagnes but then I would probably be just as happy sampling the wines. There is waiter service in the lounge and the bar appears to be similar to Rome where it is not a proper bar but staff will mix drinks and bring them over to you. There is a work area as you may expect, though the individual desks by the wine dispensers seems a bit odd with their stools instead of chairs. There are plenty of charging sockets in the new lounge. The overall style is similar to the Rome lounge, clean and modern. For me, it is a big improvement on the rather dismal and dingy lounge before. I will bring you more details when BA formally announce the opening. If you have spent over £7000 in your current Lloyds Avios credit card year you may have been confused to receive a second upgrade voucher and wondered what was going on. It appears that something has gone wrong and Lloyds have mistakenly sent out a second round of vouchers. There was silence from Lloyds for a while but the good news is that Avios confirmed on Twitter that they are aware it is a mistake but they will be honouring them. That at least makes up somewhat for the negative changes to the Lloyds card which sees the voucher being withdrawn altogether when the Amex card goes by Spring 2019. 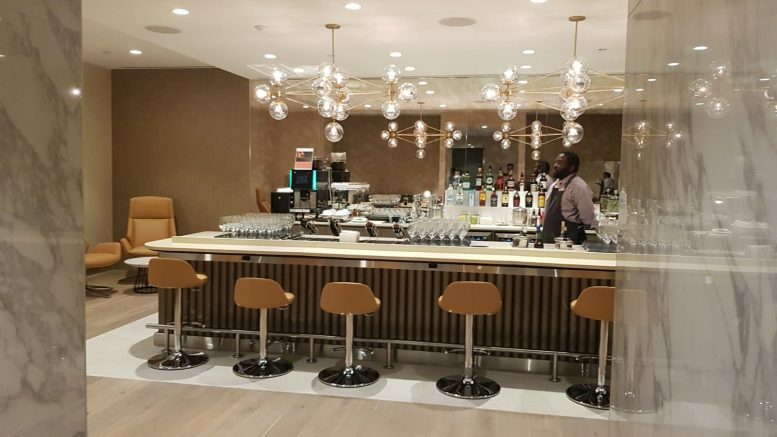 2 Comments on "News: BA changes new Club service again, first look at new BA JFK lounge & Lloyds upgrade vouchers"
Seriously though, anything to speed up the food service on a night flight gets my vote. We were sat in the last row of CW in a super hi J 747 on the way back from SFO recently and after waiting 2 hours for food we finally gave up and went to sleep. That is way too long to wait. Unfortunately it will still be hand delivered so not as quick as the old CE but definitely quicker than now.